A strip loin steak is also known as a top loin, club, Kansas City or New York strip steak. This steak comes from the top portion of the short loin, which is nestled between the cow's ribs and sirloin. Because this part of the cow does not get much of a workout, it contains more marbled fat and less muscle, resulting in a tender and juicy piece of meat. Beef is filled with essential vitamins and nutrients, and strip loin steak is also low in fat and calories. Strip steak is one of the 29 cuts that are designated as lean by the U.S. Department of Agriculture. Lean beef contains less than 10 grams of fat, under 4.5 grams of saturated fat and less than 95 mg of cholesterol per 3 oz. serving. Strip steak cuts those fat numbers in half; a 3 oz. serving contains 5 grams of fat, with 2 grams coming from saturated fat. To keep your steak as low-fat as possible, trim off all the visible fat from the edges before you grill it, and don't add any additional oils to the meat. One 3 oz. serving of strip steak contains 155 calories. Grilling it with a dry-heat method without any additional marinade is the best way to keep the calorie count down. Add flavor to the steak with low-calorie ingredients like a dry rub that consists of salt and pepper or some fresh herbs. Avoid traditional high-calorie steak toppings such as herbed butter, bleu cheese or mushrooms sauteed in butter. Strip steak is a good source of protein. One 3 oz. serving provides you with 25 grams of protein -- roughly one-half of the daily value for adults. Daily protein requirements vary by age and gender, but the average adult female should consume roughly 46 grams of protein per day, and men should consume closer to 56 grams a day. Protein is essential for the proper development of bones, tissues and muscles, and it also plays a role in regulating your metabolism. 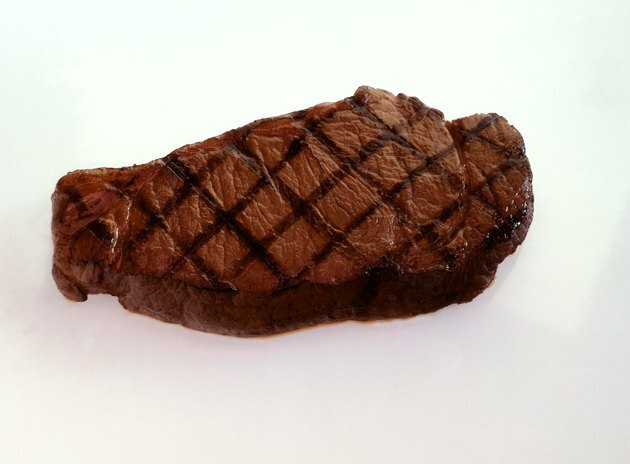 Strip steaks are rich in niacin and vitamins B-12 and B-6. One 3-oz. serving contains 17 percent of the daily value of niacin, which helps to keep your skin, nerves and digestive system healthy. A similar serving also contains 37 percent of the daily value of vitamin B-12 and 15 percent of the daily recommended value of vitamin B-6. These vitamins help to build red blood cells and promote healthy immune and nervous systems. Beef is the primary source of zinc in your diet; you'll get 38 percent of your daily value in one 3-oz. serving. Zinc is a mineral that is essential for overall growth and development. It also plays a role in cognitive functioning. Zinc promotes the quick healing of wounds, helps to keep the immune system healthy and plays a role in appetite control as well. Iron is an important nutrient for the development of healthy red blood cells, and it also assists in carrying oxygen to the body's cells and tissues. It is also important for healthy brain development -- iron is a critical component in the diet of pregnant women. One 3-oz. strip steak offers roughly 17 percent of the daily value of this mineral.